A father and son face off against a deadly tribe of Sasquatch. Following a family tragedy in which Michael and his father Roger lose both the former's mother and their home, they decide to move to a cabin in the woods owned by Michael’s young Uncle Wil. Having barely started to unpack they are joined by Wil and Roger’s obnoxious friend Sergio, who proceeds to derail the father/son time and make it about hunting, camping and toxic male bonding. When unbearably boorish Sergio decides to hunt a deer deeper into the forest he disturbs a tribe of Sasquatch, and soon the hunters are the hunted as legend becomes reality for our unhappy campers; but the real horror begins once they return to the cabin and those pesky Sasquatch follow them home. Perhaps a Sasquatch monster movie was not the best choice for a low budget indie. After all, it’s hard enough to make these films believable for audiences to get caught up in when you have a budget, let alone when you don’t. ‘Work within your means’ should be the catch cry of independent filmmakers everywhere. The effects are paramount in a film such as this and if the budget cannot support experts in the field of special effects and creature make up, then perhaps it's best to either show very little of the monster, such as Jaws chose to do after the failings of the mechanical shark lent themselves more to a comedy than a horror, or don’t attempt this type of film at all. That’s not to say that the effects are completely dire, just not very convincing the more you see of them, which makes suspension of disbelief a harder slog for the audience. For a horror, there are few scares, but one or two are very effective and hint at a talented filmmaker who has yet to hit his stride in both script and execution. It will be interesting to see what John Portanova chooses to do next, as his strengths are clearly growing. The script itself could do with some tightening, particularly as it loses steam in a saggy midsection, which offers a shock death but then fails to capitalise on the difficult ethical questions it asks, or to escalate the story to those heights again. It's unfortunate the scriptwriter (also Portanova) chose to do away with the most personable character so early, even if it was a good (though frankly not entirely plausible) plot twist. This also suffers from the horror movie rookie mistake of having a character inexplicably die from wounds that while grievous, are not immediately fatal, which made a truly tense and pretty gross scene just laughable in the end. Acting wise it’s a mixed bag; Jason Vail as Roger is serviceable in a rather weak and thankless role; David Saucedo is repellent but never truly mines the depths of his character, and this unfortunately bloodless take renders some of his actions less than believable. The two young actors fare much better with Miles Joris-Peyrafitte doing a commendable job with the minimum they actually gave him to work with; the script must’ve read ‘look on in slack-jawed shock’ at least a dozen times, even though the audience needed to see more from this character, and I do believe Joris-Peyrafitte was capable of giving more. It’s a shame the screenwriter didn’t have more faith in the character. D’Angelo Midili as Wil was clearly the stand out performance, giving us a refreshingly real character to connect with. He easily steals the show and I’d expect to see more from him in the future. All in all, not a total loss, with a sweet line in character bonding, particularly between Wil and Michael in a nicely written, dialogue-heavy scene early on in the piece. Horror-wise, some parts are eerily effective and others are just missed opportunities. 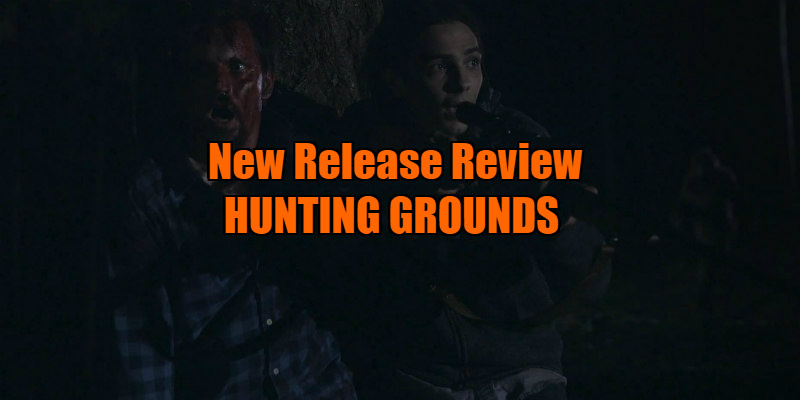 For a truly involving and scary indie Bigfoot movie, Willow Creek should be your first choice. Hunting Grounds is a distant second. 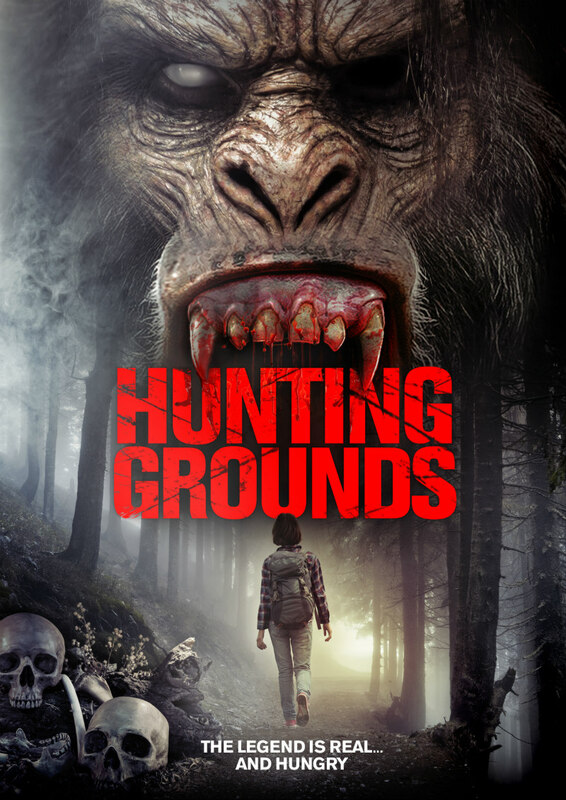 Hunting Grounds is on VOD February 7th.